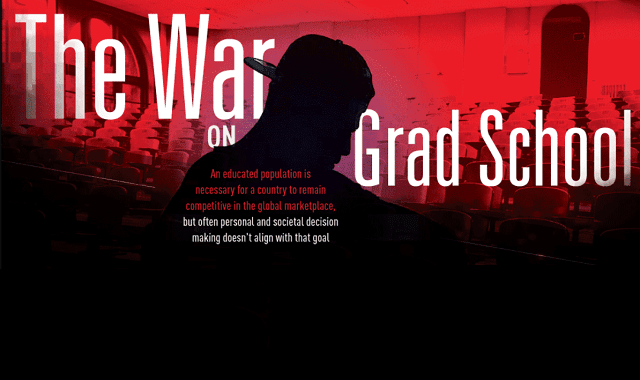 The War on Grad School #Infographic ~ Visualistan '+g+"
The cost of an undergraduate degree has skyrocketed to the point that people are graduating with an average of $30,000 in student loan debt for a four year degree. When you start talking about graduate school that number soars. Graduate school has never been more expensive than it is now, and there have never been more jobs requiring graduate degrees than there are now. This has led many to believe that there is a war on graduate school, but is that really accurate? Enrollment in graduate school is starting to level off even though there are many professions you can’t even get into at the ground level without a graduate degree. Massive amounts of student loan debt are turning many people off, even though an educated population is necessary for a country to remain competitive in the global marketplace. Learn more about the war on grad school and how to make it work from this infographic!